In the last installment, I examined cables written by Christopher Stevens in 2008 (and available courtesy Wikileaks) that seem to capture a significant trend in his thinking, and, perhaps the thinking of others in the US government, which may have helped drive the evolution of the disastrous US "Arab Spring" policy that put Uncle Sam in alliance with al Qaeda, Muslim Brotherhood and other groups driving the spread of sharia (Islamic law). This trend appears as Stevens learned how to explain -- how to rationalize, really -- the jihad corridor that eastern Libyans in particular followed to fight Americans in Iraq. While the Washington Post today quite narrowly (ignorantly) tells readers that Derna sent more jihadists to Iraq "during the U.S. occupation [sic] than any other place in Libya," the larger truth is that eastern Libya, led by Derna and Benghazi, sent more jihadists to kill and maim Americans -- whose Iraq "occupation," by the way, included fighting AQ, preventing Sunni-Shiite civil war and "nation-building" all at the same time -- per capita than any place in the world. And, as discussed in Part 2, the citizenry is extremely proud of this ultimate anti-American fact. The flag of Ansar al-Sharia, which reportedly led the Benghazi attack; and the flag of Libya Shield, which reportedly provided security to US Marines in Benghazi. Eighth Question: "Jay, There Are Some Emails That Have Emerged..."
Yesterday, Reuters, Fox, CNN, CBS and other media reported that on 9/11/12 emails went to top Obama administration officials alerting them that the Benghazi consulate was under terrorist attack. The first arrived at 4:05 pm ET on 9/11/12 -- 10:05 pm Benghazi time, about 25 minutes into the attack. At 6:07 pm ET, another email reported that Ansar Al-Sharia had claimed responsibility for the attack. At some point after that, the White House cook-up-a-protest-that-didn't-happen and blame-the-video lie began. Yesterday, also, White House spokesman Jay Carney -- he who repeatedly perepetrated the above lie in the weeks after the terrorist attack in Benghazi -- went before the press, the Fourth Estate, our eyes and ears. The skeptics. The questioners of authority. The Benghazi emails didnt come up until Question #8. Charles Woods, father of fallen ex-SEAL Tyrone Woods, called in to the Lars Larsen radio show yesterday to express his thoughts about the news that Benghazi was known to be a terrorist attack right away, was observed via Drone cameras in real time, and that relief forces remained undeployed from nearby countries. Tyrone and ex-SEAL Glen Doherty were both killed by a mortar fired at the safe house annex late in the firefight, after Wissam bin Hamid's Libya Shield Brigade had escorted eight Marines from Tripoli to the safe house. Charles Woods says: "Someone had to say `don't go rescue them.' We need to find out who gave that order and why." About that Libya Shield Brigade which 1) fought under the black flag of al Qaeda during the February 17 Revolution, and 2) escorted the eight US Marines who arrived from Tripoli to aid the Benghazi consulate under attack on the night of 9/11/12. Two Libya Shield Brigade leaders met with US diplomat(s) on September 9, according to a US embassy cable drafted by David C. McFarland, signed by Christopher Stevens and dispatched on September 11. (It was posted online by the House Oversight Committee.) This cable was first discussed in the Daily Beast on October 8 in a story recounting the fact that generic militia leaders had threatened to pull security from US interests in Benghazi, but it contains some interesting details not previously noted. Bouchra Ismaili, Dutch Labor Party member of Rotterdam City Council: "Listen up, crazy freaks, we're here to stay. You're the foreigners here, with Allah on my side I'm not afraid of anything. Take my advice: convert to Islam, and you will find peace." From The Des Moines Register staff blog comes a journalistic milestone: Obama makes the case for the paper's endorsement off the record, and the paper is perplexed. "No reason was given for the unusual condition of keeping it private," they write. "We relented and took the call. How could we not? It’s the leader of the free world on line one." Probably going off again about transparency again. Just four days before the Register’s presidential endorsement is released, Laura Hollingsworth and I received a phone call from the president. He was calling from Florida, on the heels of a morning campaign appearance and about 14 hours after his debate with GOP nominee Mitt Romney at Lynn University in Boca Raton, Fla.
Gates of Vienna has pulled together what is known about a government crackdown on British Freedom and the English Defense League, two parties that refuse to go quietly into the Islamic night over Britain. The Daily Beast's Eli Lake reports on a "suspect" in the Benghazi assault but his B-matter is more interesting. The CIA’s latest assessment also says once and for all that the assault didn’t start as a protest against an anti-Islam Internet video. In the first eight days following the attacks, Obama administration cited that video as the primary cause of the assault. The CIA presented its "latest assessment" to Congress on Friday, October 19. Once and for all, there was no video-inspired protest that spiralled into a terrrist attack in Benghazi, the multi-billion-dollar intelligence-gathering institution finally said 38 days after the attack. What Did the CIA Know and When Did It Stop Knowing It? Yesterday, we learned specifically that the CIA station chief in Tripoli reported to Washington within 24 hours that the consulate attack was executed by terrorists and was not a spontaneous demonstration over a video that turned violent. The President, of course, would continue to weave a narrative blaming the video for two more weeks, hitting that narrative's climax in his UN address on September 25. Citing the video six times in his address, Obama declared: "The future must not belong to those who slander the prophet of Islam." It seems clear that the video, not the jihad, simply had to be driver in all of the 9/11/12 Islamic rampaging or else Obama's big pitch for the Islamic anti-"blasphemy" movement wouldn't have been, even in his world, feasible. George W. Ford: Will CBS Collude with Obama in the Third Debate, Too? On February 15, 2008, Stevens wrote a lengthy cable titled EXTREMISM IN EASTERN LIBYA. On one level it confirms that Stevens was NOT some liberal naif when he docked in Benghazi in April 2011 to serve as point man to the so-called "rebels"-- that cutesy bluff of a name which disguises a movement better described by Clare M. Lopez as "individuals and groups that were, at a minimum, allied ideologically with Al Qaeda." No real stretch to simplify and call Stevens the Obama administration's point man to al Qaeda. Did Hillary Go Noble on Us? Honestly, did the buck really stop with Secretary of State Hillary Clinton on Benghazi-gate, or did the buck just stop? Stop. Clinton’s taken responsibility, she’s in charge – and then she declares that “security professionals” make the decisions? Not only is this a non sequitur, it’s nonsense. One thing Americans learned from recent House hearings about the Sept. 11 orchestrated terrorist attack on the U.S. Consulate in Libya – which killed four Americans and which President Barack Obama insisted for two weeks was sparked by a YouTube video – is that the security professional in question, Eric Nordstrom, asked Clinton’s State Department for more security and was denied. In analyzing the Benghazi scandal, it is crucial to highlight not only the dangers of relying on jihadist armed gangs for American security in Benghazi, but also the betrayal of American principle undertaken by the Obama administration in setting such a policy in place. The fact is, relying on "local militias" was not some stop-gap practice; it was official US policy. This begins to tell us why "Benghazi-gate" is so much more than an inquiry into a calamitous security break-down, and the ghastly chain of lies the administration told thereafter. On March 28, 2012, Regional Security Officer Eric Nordstrom sent a cable from Libya requesting more security. His request was denied. This cable, however, is evidence of more than State's negligence in failing to address a dangerous security situation that would be exploited by al Qaeda affiliates on September 11, 2012. In the cable, Nordstrom makes note of the fact that "rebuilding and expanding post's PSA Local Guard Force" was one of his "core objectives." Further: "As recommended by the Department, post is developing plans to transition our security staffing ... to [a model] that incorporates more locally-based and non-emergency assets." Libya Shield spokesman Hafez al-Aquri, April, 2012. 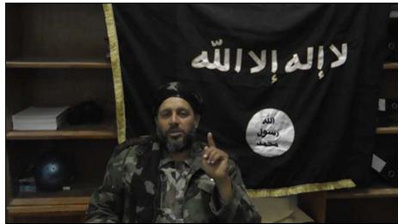 And yes, that's the black flag of al Qaeda behind him. Video and documentary evidence shows that a Libyan-government-sponsored militia that reportedly provided support to American Marines on the night of the Sept. 11 Benghazi attacks is a radical Islamic militia that, like the presumed assailants, flies the black flag of jihad. A friend writes in to underscore the importance of noting also the series of events that befell the consulate survivors on evacuating the sacked and burning compound -- without Amabassador Stevens, whose body wouldn't be recovered until much later. "The description reads like some of Mark Bowden’s descriptions of American servicemen surrounded by hostile crowds and armed gangs in Mogadishu in Black Hawk Down," he writes. As some readers will recall, a few months ago, in the spirit of columnist-bites-editor, I "spiked" the Washington Examiner after editorial page editor David Freddoso refused to run my column "Outing the Muslim Brotherhood." The column reported on a written request, then making gigantic media waves, from Rep. Michele Bachmann and four House colleagues to inspectors general at five government agencies asking them simply to investigate alarming evidence of Muslim Brotherhood penetration of US government decision-making. One of the members' exhibits was SecState Clinton's top aide Huma Abedin, whose family members, in a nutshell, have been tightly, deeply and demonstrably involved with groups and movements dedicated to the destruction of Western civilization. The lethality and the number of armed people is unprecedented. There had been no attacks like that anywhere in Libya – Tripoli, Benghazi, or elsewhere – in the time that we had been there. And so it is unprecedented. In fact, it would be very, very hard to find a precedent for an attack like that in recent diplomatic history. As Eyeore writes at Vlad Tepes writes, "this is quite a little report" by a Russian correspondent on the state of the Islamic takeover of Paris. Me, I prefer director Rouben Mamouliam's Paris, via Rogers & Hart and Maurice Chevalier. At her indispensable blog Refugee Resettlement Watch, Ann Corcoran wonders: "Are they keeping Samantha Power under wraps now so she won’t be tainted by the Libya scandal washing over Washington? And, why would they do that?" The straight line from Obama’s Libya policy of empowering Islamists to the Benghazi massacre is rarely discussed. Maybe it would be clearer if the Republican establishment had not ardently supported Obama’s war against Libya. NYT Passes on House Benghazi Hearings as a "Politicizing Thing"
The NYT's Dean Baquet, Jill Abramson and Bill Keller: Newshounds all. The explanations offered by NYT exec editor Jill Abramson and managing editor Dean Baquet for why the newspaper isn't covering House hearings on Benghazi-gate goes beyond parody, science fiction and satire. Of course, it could have been written by the Obama campaign. I talked with Jill Abramson, the executive editor, about the decision, which she said she may have set in motion while running the morning news meeting on Wednesday. “I said that I wanted us to weigh the news value against the reality that Congressional hearings are not all about fact-finding,” she said. In other words, they are often deeply politicized. Benghazi Burns and Petraeus Goes to Princeton? Two weeks ago, I wondered whether CIA Director Petraeus was politicizing the intelligence after a source told Fox News on September 27 that three days after the Benghazi assault, Petraeus briefed the House Intelligence Committee that "Benghazi was an out-of-control demonstration prompted by the YouTube video. According to the source, this was `shocking' to some members who were present and saw the same intelligence pointing toward a terrorist attack." Pat Smith's son Sean was killed during the 9/11/12 assault on the American consulate in Benghazi that left three other Americans dead including Ambassador Christopher Stevens. In her initial grief, Mrs. Smith describes being embraced by the Obama administration, and being told by "all of them" that her son's death was caused by the video. They promised her facts about his death; that's all she wanted. Biden, she says, was "a treasure." Panetta took her face in his hands and promised her the truth. She cried on President Obama's shoulder and "then he kind of looked off into the distance." She has heard nothing. She sees bloody handprints in pictures of the sacked US building and wonders if they are her son's. They are still studying it, they tell her, "and the things they are telling me are outright lies." POTUS Ring: "There is no God but Allah"
WND's Jerome Corsi has a hot one today, reporting that "according to Arabic-language and Islamic experts, the ring Obama has been wearing for more than 30 years is adorned with the first part of the Islamic declaration of faith, the Shahada: “There is no god except Allah.' "
I know you're a busy man. But this foreign policy needs some more time and thought on your part, and before your next debate with Obama. It's not that O's a foreign policy genius; he's not. It's not that his foreign policy is good; it stinks. But what you have crafted (excerpted below) is more of the same. Just as you want to remap the economic course of the nation, you should also want to remap the foreign policy course of the nation. Why? The fact is -- the fact your experts won't tell you -- through the Bush-Obama years our foreign policy course has been hijacked by a tiny band of extremists: Leftists, dupes and Islamic agents. Or, as we call them today, COINdinistas, neocons/McCainiacs and the Muslim Outreached. The Philippines government has agreed to the creation of a new Islamic substate of 4 million people in the south: "Bangsamoro." According to the AP, the accord calls for establishing a 15-member "Transition Commission" to "work out the details of the preliminary agreement and draft a law creating the new Muslim autonomous region in about two years." The accord also calls for deactivating "rebel forces" without specifying a timetable. Wasn't it great not to have to worry about what might come out of the Republican's mouth next (Bush, Bush, McCain...)? KABUL — Afghanistan's senate voted to cut the word "friendship" from a pact with France because Islamic texts say it cannot be used to describe relations between Muslims and infidels, senators said Tuesday. More to the awkward point, "Islamic texts" also say "friendship" cannot exist between Muslims and infidels, period.